Probably best known for the Mar Menor, an inland sea separated from the Mediterranean by La Manga, a strip of land 30 Km long with beaches on both sides and semi high rise holiday accommodation. The Mar Menor itself reaches higher temperatures than the Mediterranean in summer due to being quite shallow and is a favourite location for water sports. Around the Mar Menor there has been a large development of golf and other sports clubs, known collectively as La Manga Club. The other main tourist resorts include Puerto de Mazarron, which is livley in summer and has a number of superb sandy beaches, and Aguilas to the south, close to the Andalucia border. The city of Murcia, further inland has impressive historic buildings and a superb cathedral, while the smaller city of Lorca has a quaint charm and an impressive castle on the hill. Further inland still is the Sierra de Espuna natural park rising to over 1,500m. 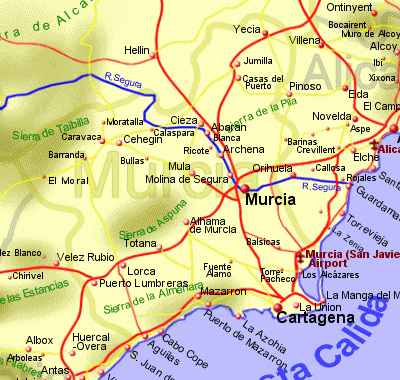 Murcia can be accessed by Murcia Airport at San Javier. We have self catering holiday rentals in Murcia in or near the following towns.